When Honda began laying the groundwork for the development of the all-new Gold Wing in 1993, the decision was made to put a younger engineer with sportbike design experience in charge of the project. That man is Masanori Aoki, Large Project Leader (LPL) on the GL1800 Gold Wing. At 33 years of age, Aoki became the LPL for the NSR250R-an unusually young age for a Honda LPL. By the time Aoki was selected to head development of the Gold Wing, his LPL's résumé featured a number of high-performance motorcycles including the CBR(r)250RR, CBR400RR and the CBR600F3. 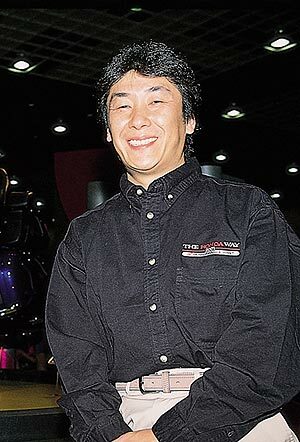 Masa-san, now 46, is a sportbike guy, which is exactly why he was chosen to lead the Gold Wing design team. We had an opportunity to interview Aoki on one of his recent trips to the U.S. Here's what he had to say about one of the most ambitious model development projects in Honda's history. Question: Why was your background in sportbike development important? Answer: That is the Honda way. We start by learning technology. Motorcycles have to have a sporty feeling and good handling. That's a motorcycle. Honda wanted to make the next Gold Wing like a sports model, without losing any touring capability. That's a vital foundation. My job is to add more fun factor to the machine, to build a Gold Wing with the kind of acceleration and handling people normally associate with sporting machines. Q: How long was the Gold Wing in development? A: The project started in 1996. After I spent three years in the United States, I returned to Japan in 1996 on February 1st. And on February 3rd, we started. Q: What did you learn about culture and touring in the United States that was important to bring back to Japan for development of this new motorcycle? A: First, I had to learn English. Next I had to learn how people enjoyed the Gold Wing. Therefore, I went to many, many rallies. In two years I went everywhere, and did a lot of long-distance riding. I went on a 2220-mile trip from Anchorage, Alaska, to Seattle, Washington. It's a long way between gas stations out there. I learned how important fuel range is to the long-distance rider. Q: Were there any other characteristics you built in to the new engine to make it sportier? A: The GL1500 engine has an electric motor quality to the power. We were after more of a motorcycle feeling. More character. More excitement. This engine (GL1800) has a lot more character in terms of a power hit, and a more free-revving character. The GL1500 engine has good power and torque, but it signs off early. You get to the rev limiter very quickly. The new Gold Wing 1800 engine has a much more high performance feel, especially at higher rpm. Q: How did you arrive at the 1800cc engine size? A: We asked ourselves what displacement is best to meet emission standards and fuel consumption, as well as optimum horsepower, torque and weight balance compared to the current model. Ultimately, it was still difficult to decide on the optimal displacement, so we asked American riders. Ninety percent of them liked the 1800. Q: Once you'd arrived on the optimal engine configuration, how did you decide the distance Gold Wing should go on one tank of fuel? A: Our original target range was 234 miles on one tank of fuel, but we're getting more than that now. I know that number very well. There are many gas stations between California and New York. But I was touring on the Trans-Alaskan Highway between Anchorage and Seattle, and there aren't many stations out there. Range is a very important number. Our target was to improve fuel consumption by 30 percent at 75 mph compared with the previous engine, most of which would come from the efficiency of fuel injection. The Gold Wing FI system is the same basic high-pressure design as CBR1100XX and CBR929RR. Ten percent of the increased fuel economy comes from improved aerodynamics and decreased frontal area. We also added a larger fuel tank: 25 liters compared to 24 liters for the previous model. Q: How many new technologies were developed for the Gold Wing? A: We developed more than 20 new technologies. And all the very stringent durability standards that applied to the 1500 also apply to this 1800cc engine. Q: Let's talk about the chassis. Why use an aluminum frame instead of steel? A: A lot of sport bikes have an aluminum frame because it is easier to manipulate rigidity and light weight throughout the structure than with steel. These same qualities allowed us to build the Gold Wing frame with specific strength and rigidity qualities where we needed them. Aluminum also projects a much more sporty image than steel. While it was very efficient, the frame on the previous model was not beautiful. This new frame is an important part of the machine's style. Also, there is the question of manufacturing efficiency. Rigidity is very high with the new frame, and the number of parts is drastically reduced. The aluminum frame is also 25 pounds lighter than the steel frame. Q: Now that the new Gold Wing is completed and in production, what is your goal for the marketplace? A: My hope is that the people who buy the new Gold Wing enjoy riding it as much as I have enjoyed building it.